WE NEED TO DISCOVER WHAT’S CAUSING THE DELAY. MEASURING PERFORMANCE WITH SERVER TIMING WHAT IS SERVER TIMING? ▸ W3C Specification ▸ HTTP response header ▸ Sends basic timing information from server to client ▸ That’s it. A thing called db had a duration of 123 milliseconds. Server-Timing: db;dur=123, tmpl;dur=56 A thing called tmpl had a duration of 56 milliseconds. 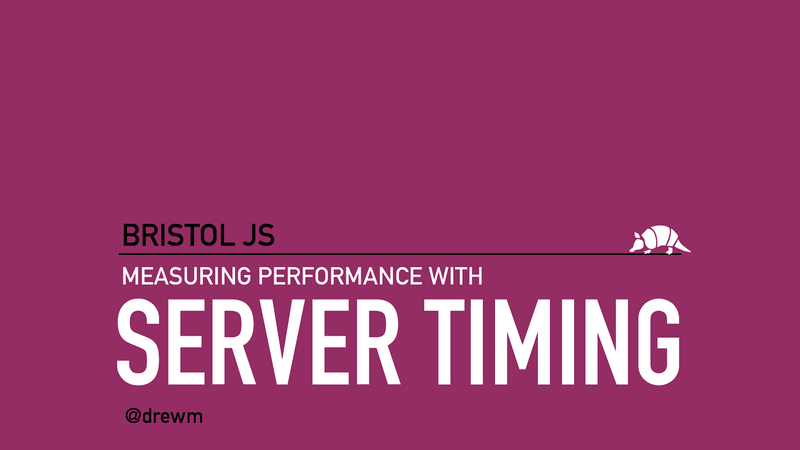 MEASURING PERFORMANCE WITH SERVER TIMING EACH METRIC HAS THREE POSSIBLE PROPERTIES 1. A short name for the metric (such as db in our example) 2. A duration in milliseconds (expressed as dur=123) 3. A description (expressed as desc=“My Description”) Each property is separated with a semicolon as the delimiter. Server-Timing: datacenter;desc="East coast data center"
Server-Timing: paint; dur=123; desc="Rainbow painting", bjork; dur=333; desc="Emailing Bjork", total; dur=457.90863199999995; desc="Total Response Time"
View Measuring Performance with Server Timing on Notist.